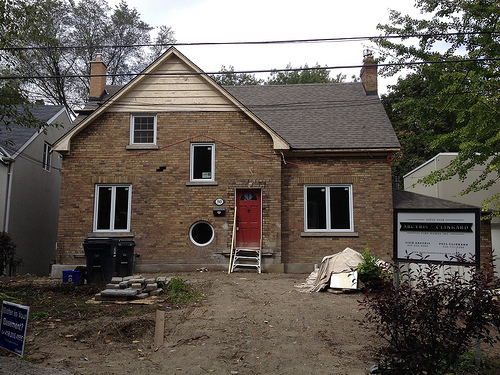 Slowly but surely, our house renovation is moving along. 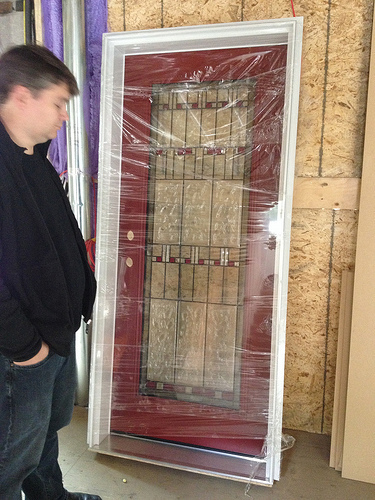 Almost all our new windows have been installed. We weren’t planning on doing that upstairs one at the front of the house, until we saw how awful it looked next to the brand new ones, so that one has been ordered to. By the way I apologize for the crappiness of some of these photos, but I don’t always bring the fancy camera with me when we go by the house so I have to rely on my iPhone. Our patio double doors continue to be delayed (the windows were 3 weeks late, the patio doors were supposed to arrive at the same time but haven’t). So the first round of spray foam has gone ahead so that they could do the first of three blower-door tests to check the seal. A new roof has been put on, and they’re working away at scraping and preparing the wood siding for paint, and soon aluminum flashing will go up on the soffits and facsia, and new eaves troughs will go in. Soon, drywall. 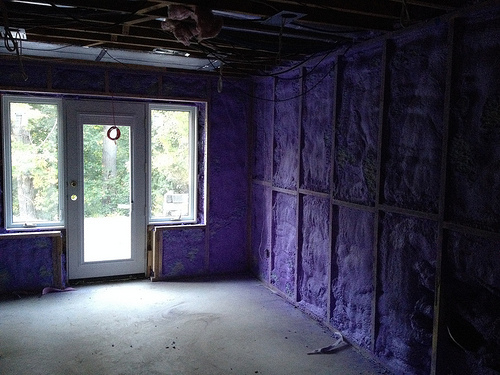 Already, with the spray foam, you can get a feel for the real perimeters of the rooms. 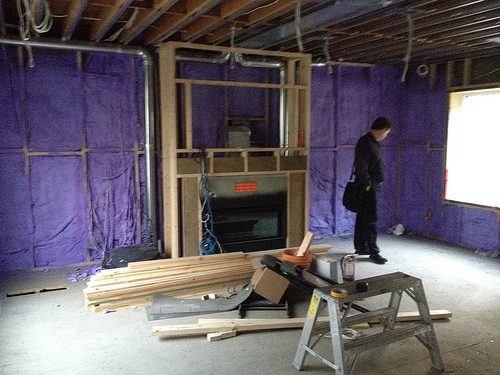 I can’t wait to see it drywalled! We’re now looking at move-in for December 1st, and the ground around the house needs time to settle, at least until next spring, before we do any real landscaping. So unfortunately my plans to plant my saved tulip bulbs and garlic crop for next year are on hold. Instead, I’m going to plant everything I can at the farm (thanks Mom!). I dont think the boxes of tulip bulbs I saved would last an extra year stored that way, so I will plant them there and then dig them up again next year. Oh for the love of tulips! As crazy as this sounds, it means we get another crack at sorting the colours out properly, I hope.